Enter and win the MannaPro - Stealth Hunter Sweepstakes. MannaPro is doing a great giveaway/sweepstakes, where you can win a Stealth Night Hawk 4x4 EV and many more prizes that you can see from the above picture. 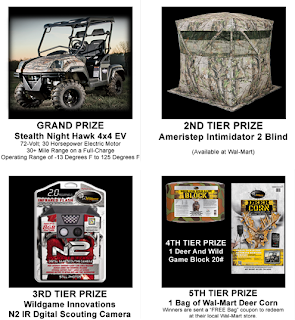 The second tier prizes are 40 Ameristep Intimidator 2 Blind, which is also a great item. 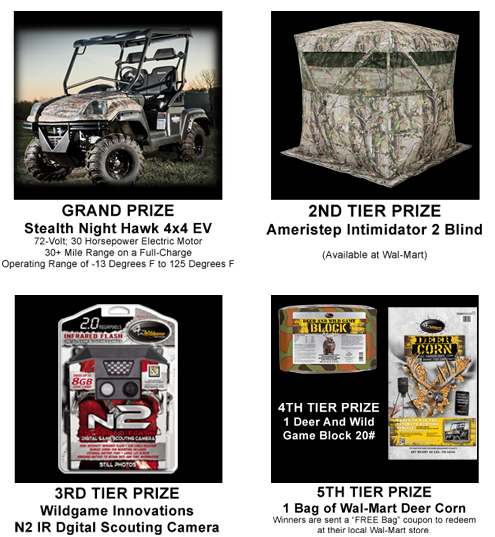 The third tier prize is Wildgame Innovations N2 IR Digital Scouting Camera and fourth, which in the above picture is listed as 5th is 1 Bag of Wal-Mart Deer Corn. Take advantage in the sweepstakes by entering your information on the website.